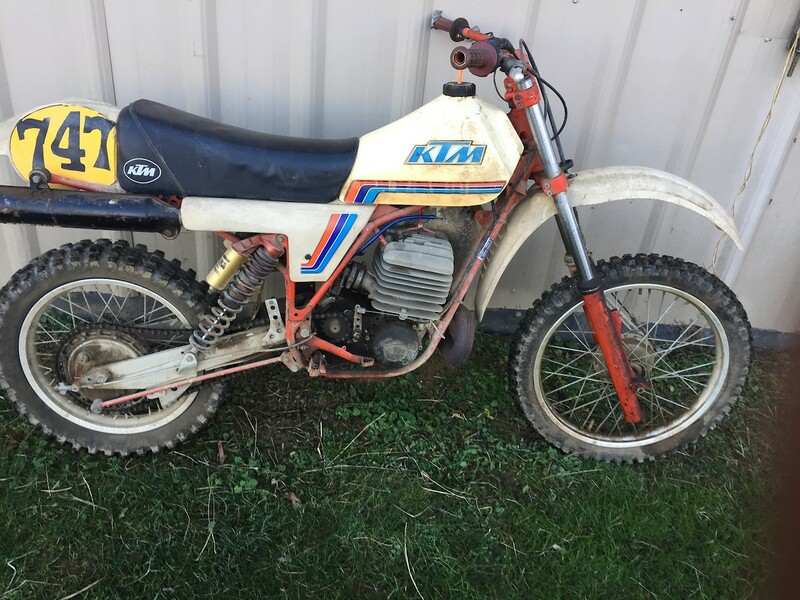 Got my 1981 KTM 495 out of barn over weekend. Wiped dust off and got fired up. How much fork oil do theses take? Is this the model Dirt Bike magazine got up to 120+ mph back in the day ? Easy now, that thing has drum brakes! THERE IS NO SECOND MOTO IN LIFE! As long as the oil is 1" above the top of the damper rods when the forks are compressed you will not have too little or too much, and the forks will work, however, the correct level will likely be a bit higher. As far as 495 info goes, try the link below. This link from the site above is the 81 service manual. Here is the fork page with the oil level. Killer bike by the way, and you should go vintage racing with it. Thanks for the comments. Disc brakes came a couple tears later and I'm sure fork seals will need changed after 38 years. Bought this new in 1981 from Dirty Harrys in Pittsburgh. Actually went to Lorain OH to pick up at KTM. Everything is original except grips, gas line and a few nuts and bolts. Plastic is yellowing and getting brittle but it is running good. Cool bike. I remember dirty harrys too. I use to live in Butler and collected bikes around the western pa area. Only saw a KTM495 once about 20 years back when I visited a house to give remodeling estimate. Any chance you live East or north east of Pittsburgh? Cameron WV. Between Wheeling WV and Waynesburg PA. I have only seen a couple others back in the day. Amazing that I can remember that article in DB... I guess it was memorable, because I never thought a dirtbike would go that fast. From what I remember they only changed a couple of sprocket teeth..
Yeah they took it out to a dry lake bed somewhere. I had the issue but I don't think I do anymore. They ma have the issue online in the link I posted. barnett468, don't see the speed record story on your link, but found it at below. I don't know how to link. They changed gearing, leaned everything out and even went into tuck position with road race leathers. Nice . Thanks for posting that. I just read it, very cool. they did do a little engine work though but I'm not sure why they they raised the cylinder, because it really is no longer stock at that point and is similar to porting the engine although the lost compression. "The deck height was changed to 1.4mm, from a normal height of .8 to .9mm. Intake and exhaust manifolds were carefully matched, but no porting was done." Does a little lower compression let it rev a bit tighter on top ? Bet it dampened the stock power curve. I dont know about ktm bigbore, but on high reving small bore engines you keep compression ratio low(or moderate) to get more revs. Raising cylinder by replace basegasket or add a second one is probably to get more revs, and less heat. It would also reduce detonation, if the model had problem with it. Ohlins on the rear. Nice. I think you are right on detonation issue as the reason for deck height increase. Air cooled 14:1 compression ratio on extended full throttle run, recipe for detonation. KTM lowered the compression in later years. I can remember watching John Finkeldey throw one of those around like it was an 85. Sweet find, they sure don't make them like that anymore. Congrats! Sweet bike, that is very cool!! Bet that left side kicker is a bear though! It is tough to kick with the left hand lever with awkward angle, plus the bike height. Milk crate helps when cold. Got to get the piston in just the right spot to start your kick.